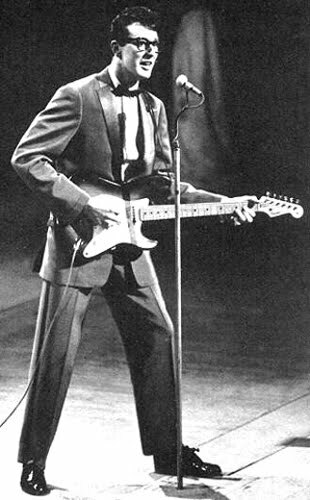 Charles Hardin Holley (September 7, 1936 – February 3, 1959), known professionally as Buddy Holly, was an American singer-songwriter and a pioneer of rock and roll. Although his success lasted only a year and a half before his death in an airplane crash, Holly is described by critic Bruce Eder as "the single most influential creative force in early rock and roll." His works and innovations inspired and influenced contemporary and later musicians, notably The Beatles, Elvis Costello, The Rolling Stones, Don McLean, Bob Dylan, and Eric Clapton, and exerted a profound influence on popular music. Holly was among the first group of inductees to the Rock and Roll Hall of Fame in 1986. In 2004, Rolling Stone ranked Holly #13 among "The 100 Greatest Artists of All Time". 70 – A Roman army under Titus occupies and plunders Jerusalem. 1191 – Third Crusade: Battle of Arsuf – Richard I of England defeats Saladin at Arsuf. 1228 – Holy Roman Emperor Frederick II landed in Acre, Palestine and started the Sixth Crusade, which resulted in a peaceful restitution of the Kingdom of Jerusalem. 1695 – Henry Every perpetrates one of the most profitable pirate raids in history with the capture of the Grand Mughal ship Ganj-i-Sawai. In response, Emperor Aurangzeb threatens to end to all English trading in India. 1812 – French invasion of Russia : The Battle of Borodino, the bloodiest batlle of the Napoleonic Wars, was fought near Moscow and resulted in a French victory. 1818 – Carl III of Sweden-Norway is crowned king of Norway, in Trondheim. 1864 – American Civil War: Atlanta, Georgia, is evacuated on orders of Union General William Tecumseh Sherman. 1876 – In Northfield, Minnesota, Jesse James and the James-Younger Gang attempt to rob the town's bank but are driven off by armed citizens. 1893 – The Genoa Cricket & Athletic Club, to become one of the oldest Italian football clubs, is established by British expats. 1907 – Cunard Line's RMS Lusitania sets sail on her maiden voyage from Liverpool, England to New York City. 1909 – Eugene Lefebvre crashes a new French-built Wright biplane during a test flight at Juvisy, south of Paris, becoming the first 'pilot' in the world to lose his life in a powered heavier-than-air craft. 1920 – Two newly purchased Savoia flying boats crash in the Swiss Alps en-route to Finland where they would serve with the Suomen Ilmavoimat, killing both crews. 1921 – Legion of Mary is founded in Dublin, Ireland. 1922 – In Aydin, Turkey, independence of Aydin, from Greek occupation. 1929 – Steamer Kuru capsizes and sinks on Lake Näsijärvi near Tampere in Finland. 136 lives are lost. 1936 – The last surviving member of the thylacine species, Benjamin, dies alone in her cage at the Hobart Zoo in Tasmania. 1940 – World War II: The Blitz – Nazi Germany begins to rain bombs on London. This will be the first of 57 consecutive nights of bombing. 1940 – Treaty of Craiova: Romania loses Southern Dobrudja to Bulgaria. 1942 – Holocaust: 8,700 Jews of Kolomyia (western Ukraine) sent by German Gestapo to death camp in Belzec. 1942 – Australian and US forces inflict a significant defeat upon the Japanese at the Battle of Milne Bay. 1943 – A fire at the Gulf Hotel in Houston, Texas, kills 55 people. 1943 – World War II: The German 17th Army begins its evacuation of the Kuban River bridgehead (Taman Peninsula) in southern Russia and moves across the Strait of Kerch to the Crimea. 1945 – Japanese forces on Wake Island, which they had held since December of 1941, surrender to U.S. Marines. 1970 – Fighting between Arab guerrillas and government forces in Amman, Jordan. 1977 – The 300 metre tall CKVR-DT transmission tower in Barrie, Ontario, Canada is hit by a light aircraft in a fog, causing it to collapse. All aboard the aircraft are killed. 1986 – Gen. Augusto Pinochet, president of Chile, escapes attempted assassination. 1996 – American Hip-Hop star Tupac Shakur is fatally shot four times on the Las Vegas strip after leaving the Tyson-Seldon boxing match. 1999 – A 5.9 magnitude earthquake rocks Athens, rupturing a previously unknown fault, killing 143, injuring more than 500, and leaving 50,000 people homeless. 2004 – Hurricane Ivan, a Category 5 hurricane hits Grenada, killing 39 and damaging 90% of its buildings. 2010 – A Chinese fishing trawler collided with two Japanese Coast Guard patrol boats in disputed waters near the islands. The collisions occurred around 10am, after the Japanese Coast Guard ordered the trawler to leave the area. After the collisions, Japanese sailors boarded the Chinese vessel and arrested the captain, Zhan Qixiong. 1741 – Blas de Lezo, Spanish admiral.